by how much you don’t want to play this game. 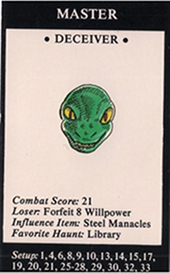 Tom O’Keefe is our local Game Master here at lonercomics. BEHOLD his jaw-dropping collection of games. Tom picked up Chill: Black Morn Manor at a thrift store for four dollars, and boy are we glad he did. 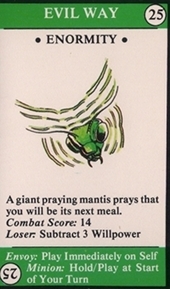 Consider the game a misguided amalgamation of Clue and Go Fish and a scary story you made up when you were five. One player takes the role of the Master, a ghoul whose purpose is to haunt the manor for eternity. 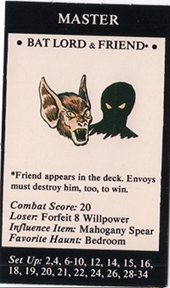 Everyone else plays a team of “Envoys” who bumble around the manor attempting to guess the Master’s identity (“Are you… Bat Lord and Friend?”). 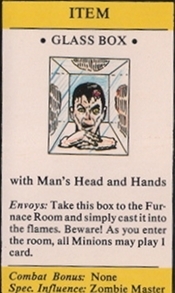 Throughout the game you must overcome various “Evil Ways” such as “ENORMITY” and “FLESHCRAWL” as you venture towards the Crypt where the Master lies in wait. Tom: Um, are you… The Deceiver? I know you have a thousand questions. 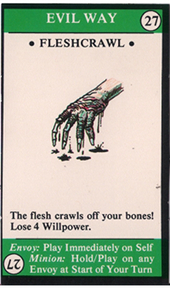 Why is The Deceiver’s mortal weakness “Steel Manacles”? Could he not continue to deceive us while in a manacled state? And just what is it about the bedroom that makes it Bat Lord and Friend’s favorite haunt? To complete this review, I spoke with Tom about the game’s myriad shortcomings. Maggie: So Tom, what is it about this game that’s so… off? Tom: Well Black Morn Manor was produced by a role playing game company, and consequently I don’t think they understood much about good boardgame design. Like most hobby boardgames of that era (mid-eighties), it is based around a theme and experience without much consideration given to gameplay. Maggie: There isn’t much competitive aspect to this game. The “Envoys” work together as a team called SAVE, which stands for Societas Argenti Viae Eternitata, or The Eternal Society of the Silver Way. 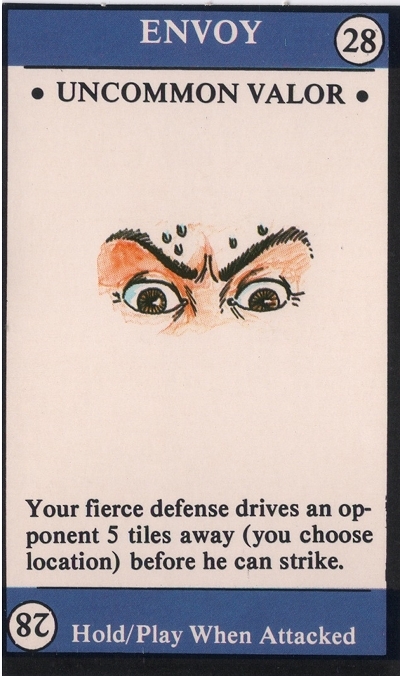 I guess it’s meant to foster a fraternal spirit between players as they fight to expel the Master from the manor, but ultimately it just fosters boredom, and a feeling that your individual contribution to the game has no value. Tom: I think Black Morn Manor’s unique failing is that while the players do make “strategic” decisions in the game, those decisions seem sort of trivial. Where do you place your tile? Put it in your path. Where should I go? Go towards the manor. 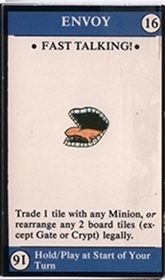 What card do I play? Well, half of the cards force you to play them immediately, some you can’t play at all unless you’re a “Minion,” and the remaining few are useful only in certain conditions so it’s always pretty obvious when to play them. Maggie: There doesn’t seem to be an ideal player for this game. It’s too lacking in stratagem to be stimulating for adults, but the rules are too diffuse and odd for kids to understand. Tom: It’s true. As a rule of thumb, games with few decisions or easy decisions are best when the game is quite snappy. Longer games should give the players something more meaty to chew on, or else the whole thing can feel like a waste of time. Nobody would play Go Fish if it took as long as a game of Bridge. 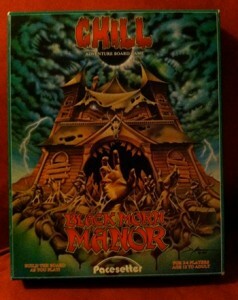 Black Morn Manor’s stilted pace, pre-programmed feel and length made it a truly dull affair from a gameplay standpoint. Maggie: So let’s say we have a time machine, and our top priority is returning to 1985 to give the designers of Black Morn Manor a piece of our minds. What would you tell them, Tom? Tom: 1) Cut the game’s length in half. 2) Give each character different special powers. Same with the magic items. 3) The process of discovering the master’s identity needs to be less tedious, and to involve more deductive skill rather than simply trial and error. Maggie: Thanks for talking with us today, Tom. 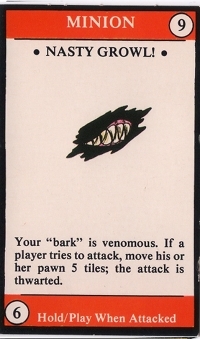 Your “bark” is truly venomous. So that’s the word on Chill: Black Morn Manor. The truly great news is that there exists a Black Morn Manor-inspired book! “There are streets you should not walk down, doors you must not open, people you dare not speak to… So begins this anthology of 16 tales of terror.” I’m certain it’s worth the seller’s price of 100 dollars. I do so long to be chilled to the bone! OMG we have to get that book. Mayhaps The Deceiver DECEIVED you all into thinking the game was but a trivial bore, to prevent the ESotSW from pursuing future de-spooking missions! The book is listed under multiple titles on Amazon. Under this name (link) it starts at $2.25 for a used copy. I await a review from lonercomics.